The economic threat the black market poses to legalized recreational cannabis sales may have been vastly overstated. According to a new consumer market research study from the editors of Marijuana Business Daily, more than 60% of cannabis users said their biggest concern when purchasing marijuana is buying it from legal sources. 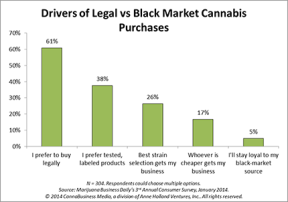 A large percentage also prefer to buy tested, labeled cannabis products or purchase from those offering a large selection of strains – two areas in which state-legal dispensaries have a huge edge over the black market. Legal retailers and growers have been concerned because black market producers have two major market advantages. Firstly, their cost of goods is far lower, as they generally do not pay taxes, lab testing fees, licensing fees, etc. Secondly, most black market producers have longstanding customer relations that might present a barrier to competition. These concerns were underscored when Washington State research, conducted by BOTEC Analysis Corp in 2013, revealed that legal retail might only be able to gain 15-25% of total recreational market share. However, new consumer data indicates the exact opposite may be true. In fact, the only two categories in which the black market has a distinct advantage to consumers – pricing and relationships – may be the least important market drivers with just 17% and 5% of responses respectively. The study was conducted by the editors of Marijuana Business Daily via an online survey in January 2014 to self-identified cannabis consumers in the US who use marijuana for recreational versus medical purposes. 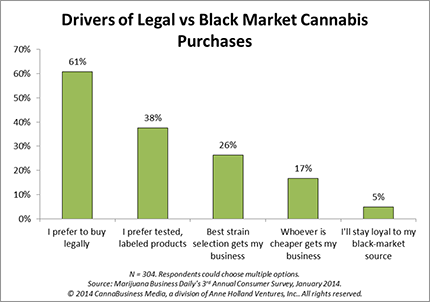 Respondents could check multiple answer options to the question asking what factors would be behind their decision to buy legally or on the black market. “I prefer to buy legally” was the overwhelmingly popular answer with 61% of respondents selecting this option. Consumer preferences aside, the black market still poses a significant threat to legal growers and retailers. With tens of billions of dollars in annual sales at stake, criminal elements who control large market shares of the current black market could be mounting a fight to retain market share, particularly in unregulated states. Additionally, while the majority of consumers said finding the cheapest cannabis is not the most important consideration, a significant difference in prices between retail shops and the black market could push more customers underground. I’m not to inspired to believe these conclusions with a sample size of 304. It’s possible the findings are spot-on, but 304 respondents doesn’t seem like a valid sample. Is it? Generally, stats folks want to see at least 50 respondents per answer option – so this question with 5 options needed 250 respondents to be considered data worth looking at. As the article notes, the resulting data also fit the trends we’ve seen in other surveys we’ve run to the cannabis consumer marketplace for the past three years. This data is also born out by early sales results from the Colorado marketplace. So, although it is surprising in the light of industry fears and the BOTEC research, it’s not terribly surprising to our editors who’ve followed this closely day in day out for years. Thanks for the explanation amneh… IMHO, I believe that as time goes by, the numbers of those “remaining loyal to their black market source”, as well as “whoever has the best price gets my business” will dwindle. The longer it’s legal, the more normal it will be to purchase their cannabis from a “legal source”. Therefore reducing the black market even further. You’ll ALWAYS have those that continue to sell on the black market, but once it becomes unprofitable for them, those numbers will dwindle even further. The Black Market will exist, up until its no longer needed. Dispensary Prices of an eighth of Marijuana in Washington DC are between 75-100 bucks. Street Prices are between 45-60. Patients usually can’t afford this price gauge, for substandard weed. Until this fixes DC Patients will continue to buy off Street. Let us see what the legal stuff costs. In Washington the only way growers producers and retailers will be able to break even 1oz will at least double in price. 502 was voted in buy ignorance of the law most people did not read it. We will have to see how things shake out. After all, white lighting is still illegal and the black market for it is fine in the blue ridge. It seems that the Black Market may then target youth more heavily?